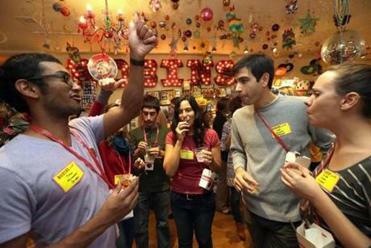 Omar Aniff (left) of Boston gives a thumbs up during a licorice tasting at Robin’s Candy on Newbury Street. His group at Robin’s Candy Shop, a small, below-street-level establishment, is eating, and drinking, it up. 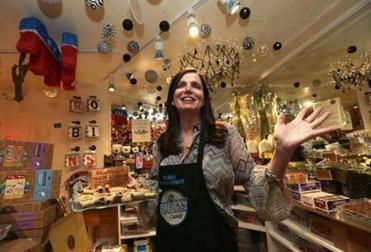 Owner and licorice connoisseur Robin Helfand has been offering tastings since opening the shop in 2012. (She has another, five-year-old location in Great Barrington.) “People are tired of the same old, same old,” she says. Tastings ($35 to $50 per person) are customized, and on this night the setting is cocktail-party-casual. The roughly twenty 20-somethings are enjoying licorice with an assortment of interesting drinks provided by Bauer Wine & Spirits down the street, and savory snacks from Cafeteria, another Newbury Street neighbor. As attendees arrive, a Robin’s Candy employee checks IDs, then hands each guest a small cardboard take-out food box on a red satin string to hang around their necks or over a shoulder. These are the equivalent of wine tasting spit cups. Helfand’s daughter, Jesse Glicker, is circulating through the crowd with another employee, offering trays of Bellinis followed by Robin’s Candy’s version of Jello-O shots: vodka with gummy bears. In the United States, many kids grew up thinking licorice was either black or red, and came in long twisted strands or laces. Helfand points out that the red variety, while a perfectly acceptable candy, is not licorice at all. The other popular alternative in this country is pink-and-white, candy-coated Good & Plenty. Again, no actual licorice involved. Helfand passes out a tray of Good & Plenty, which is flavored with licorice-tasting anise, then follows it up with its Dutch inspiration, Chalk, coated white and made with pure licorice root. In some parts of Europe, licorice is the go-to candy — as well as throat, cough, and stomach soother — and the variety is impressive. Helfand carries 65 to 95 selections at any given time, which she imports from all over the world. The majority are Dutch, as the Netherlands has the world’s highest per capita consumption of licorice. But throughout the evening attendees also sample Australian Kookaburra, mildly salted Finnish black licorice, English Pontefract Liquorice, Italian pastille chips, and Swedish Lakerol infused with eucalyptus. “I’m most passionate about the opportunity to make a community. 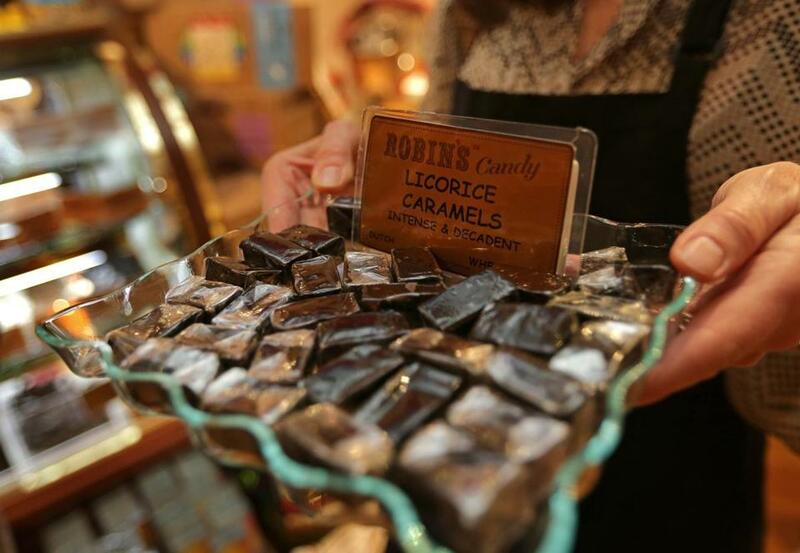 We really view [the tastings] as a reason for hanging out,” said Robin Helfand, licorice connoisseur and owner of Robin’s Candy Shop. More unusual is Banana Monkey licorice, made in the Netherlands and said to be Elvis Presley’s favorite. As Helfand passes them around, they’re a hit with the young professionals, too. Toward the end of the tasting, she announces, “Chocolate and licorice is the wave of the future.” This is a lead-in to “the finest Belgian chocolate enrobing the finest Dutch licorice,” which Helfand circulates with what she says is one of the shop’s most popular and unusual offerings, dulce de leche-wrapped licorice. The two score extremely high marks, as indicated by a show of hands. Earlier, Helfand had said that she usually doesn’t select items for the entire tasting in advance, preferring to gauge the crowd’s openness to out-of-the-ordinary flavors as the event progresses. The arrival of salt licorice is an indication that she believes this is a receptive audience. She offers two options, one “less intense,” the other “the saltiest allowed in the US.” Receptive crowd notwithstanding, the spit cups prove to be very valuable at this point. As does the final cocktail, another house-made chocolate liqueur – this one dark. Everybody leaves with a gift bag of Dutch licorice laces, and a complimentary Robin’s toothbrush. ROBIN’S CANDY 253 Newbury St., Boston, 857-263-7618, www.robinscandy.com.